Biotin is a useful natural compound, found in the body, where it contributes to normal energy-yielding metabolism. Biotin also contributes to the maintenance of normal hair and skin. Supplementing with biotin in tablet form is a good way of ensuring your daily diet contains optimal levels of this important compound. 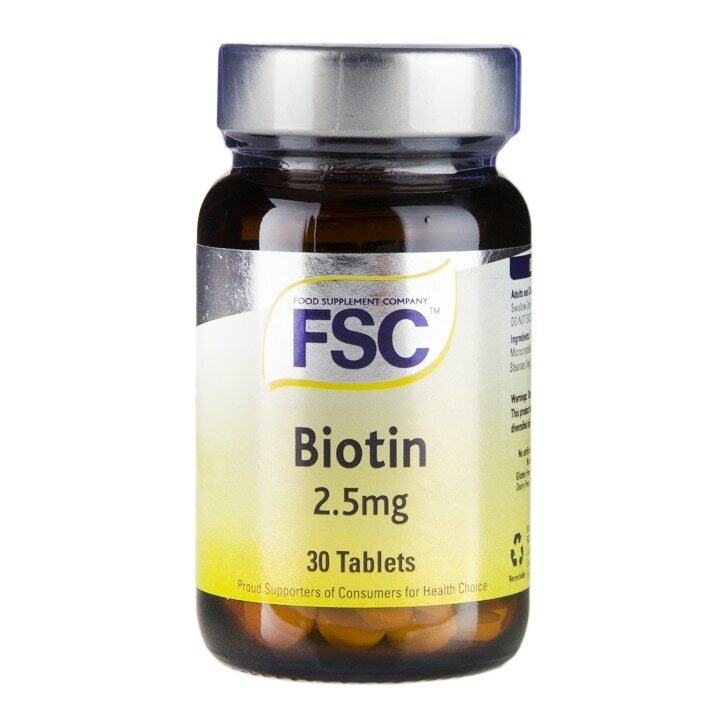 Cover your bases in just one tablet with FSC Biotin. Bulking Agents: Dicalciurn Phosphate Anti-caking Agents: Stearic Acid Magnesium Stearate Biotin Yeast free. Suitable for Vegetarians and Vegans No Artificial Flavours or Preservatives, No Added Sugar, Salt or Colours, Glut Free,Wheat Free,Yeast Free, Dairy Free, Corn Free, Soya Free, Suitable for Vegetarians and Vegans.